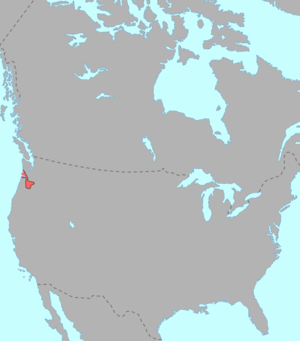 The Chinookan languages were a small family of languages spoken in Oregon and Washington along the Columbia River by Chinook peoples. All are now extinct, although Upper Chinook had 270 self-identified speakers in 2009-2013. Chinookan consisted of three languages with multiple varieties. There is some dispute over classification, and there are two ISO 639-3 codes assigned: chh (Chinook, Lower Chinook) and wac (Wasco-Wishram, Upper Chinook). For example, Ethnologue 15e classifies Kiksht as Lower Chinook, while others consider it instead Upper Chinook (discussion), and others a separate language. The vowels in the Chinookan languages are /a i ɛ ə u/ as followed. Stress is marked as /á/. As in many North American languages, verbs constitute complete clauses in themselves. Nominal may accompany the verbs, but they have adjunct status, functioning as appositives to the pronominal affixes. Word order functions purely pragmatically; constituents appear in decreasing order of newsworthiness. Clauses are combined by juxtaposition or particles, rather than subordinating inflection. Verbs contain an initial tense or aspect prefix, ergative pronominal prefix, obligatory assaultive prefixed, dative prefix, reflexive/reciprocal/middle, adverbial, directional, and verb stem. The number of tense/aspect prefix distinctions varies among the languages. Kiksht shows six way tense distinctions: mythic past, remote past, recent past, immediate past, present, and future. The pronominal prefixes are obligatory, whether free nominals occur in the clause-or not. Three can be seen in the Kathlamet verb. The ergative refers to agent of a transitive verb, the absolutive to patient of a transitive or single argument of an intransitive, the dative to indirect object. Reflexive prefixes can serve as reciprocals and as medio-passives. When the reflexive follows can ergative-absolutive pronoun sequence, it indicates that one indirectly affected is the same as the ergative. When it follows an absolutive –dative pronoun sequence, it indicates that one indirectly affected is associated with the absolutive, perhaps as the whole in a part-whole relationship, or the owner. Verbs stems may be simplex or compound, the second member indicating direction, including motion out of, from open to cover especially from water to shore or inland, from cover to open, especially toward water, into, down or up. Suffixes include repetitive, causatives, an involuntary passive, completive, stative, purposive, future, usitative, successful completive and so on. Nouns contain an initial prefix, pronominal prefix, positive prefix, inner normalizer, root, a qualifying suffix, plural, and final suffix. Initial prefix serve primarily as nominalizers. Masculine prefixes appear with nouns designating male persons, feminine with those denoting female persons. The neuter may indicate indefiniteness. All are used for nouns referring to objects as well. Masculine prefixes appear with the large animals; feminine for small ones. Masculine prefixes also appear with nouns expressing qualities. The gender/number prefixes is followed by possessive pronominal prefixes of the verb. These distinguish first, inclusive, second, third, fourth (indefinite) person, dual and plural possessors. The possessive prefixes are followed by noun stem, perhaps including another nominalizer. Nominal suffixes indicate emphasis or contrast, specificity, succession in time, definiteness, plurality, and time, location, or similarity. 2. The possessive prefix for the first person singular "my" is –gE (Wishram-g-,-k-;- x̩ -before k-stops) when the noun is feminine, neuter, dual or plural, but –tcE-,-tci-(Wishram-tc-) when the noun is masculine. 3. Aside from certain secondary irregularities in the third person dual and third person plural which don't concern us, the pronominal subject of the transitive verb differs from the pronominal subject of the intransitive verb only in the case of the third person singular masculine and third persoonsingular feminine, the difference between the two sets of forms being for the most part indicated by position and, in part, by the use of a "postpronominal" particle-g-which indicates that the preceding pronominal element is used as the subject of a transitive verb. The original Chinook Jargon was a simplified language, originally used as a second language by speakers of other Native American languages in the area. It has sentence-initial negation which is atypical of regional languages and doesn't have typical complex morphology. It has SVO structure: Chinookan and Salishan are VSO, e.g., Haias olo tso naika [much hungry water I] "I'm very thirsty". However, local Athabaskan languages are SOV, so this is probably a result of contact – a cross-language compromise. Only later did Chinook Jargon acquire significant English and French lexical items. There were Lower and Upper Chinookan groups, only a single variety of the latter now survives: Wasco-Wishram (Wasco and Wishram were originally two separate, similar varieties). In 1990, there were 69 speakers (7 monolinguals) of Wasco-Wishram; in 2001, 5 speakers of Wasco remained; the last fully fluent speaker, Gladys Thompson, died in 2012. Chinook-speaking groups were once powerful in trade, before and during early European contact (Lewis & Clark), hence developed the Chinook Jargon – a pre-European contact language, with lexicon from at least Chinook, Chehalis, and Nootka or Nuu-chah-nulth. Chinook people were quickly diminished by European diseases: Numbered around 800 persons in 1800; they mixed with Chehalis (in fact, the very word Chinook is a Chehalis word for those who lived on the south of the river). Most of the language family became extinct as separate groups by 1900, except a few hundreds who mixed with other groups. Around 120 people in 1945, though some 609 were reported in the 1970s, having by then mixed extensively with other groups. Language is now extinct. Chinook Jargon also flourished from 1790s–1830s, then experienced a flood of English and French new vocabulary. It was used by up to 100,000 speakers of 100 mother tongues in the 19th century. Then declined, was recorded by linguists in the 1930s, and died out by the early 1900s. The Chinook people were finally recognized by the US Govt. in Jan. 2001, but in the 90-day grace period the Quinault Tribe filed an appeal stating that the Chinook Nation made mistakes when applying for federal recognition. ^ Hammarström, Harald; Forkel, Robert; Haspelmath, Martin, eds. (2017). "Chinookan". Glottolog 3.0. Jena, Germany: Max Planck Institute for the Science of Human History. This page was last edited on 6 January 2019, at 02:41 (UTC).